The Makita DC18RD 240V Li-ion 7.2v - 18v fast charger is able to coconsecutively charge 2 Makita batteries with the same performace and charge times as charging 1 battery. 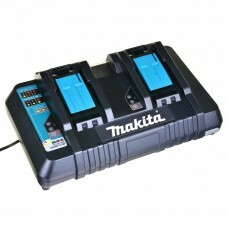 This means that you can now charge 2 batteries, in the time is used to take you to charge one and seeing as Makita already had the fastest charging battery on the market that really is saying something. This model also has a very handy USB charging port for charging mobile phones, tablets and mp3 players. The DC18RD uses a CPU to communicate with the batteries built in memory chip during a charge cycle, which analyses the data stored in the battery chip to decide on the best charging method at that time. This innovative technology results in longer battery life. Makita DMR104 DAB Job Site RadioAlthough designed for use with the Makita LXT Lithium-Io..
18V CIRCULAR SAW 165MM LXTDSS611ZTechnical specificationsTopBattery TypeLithium-ion Body only m..
TWIN 18V CIRCULAR SAW 185MM LXTDHS710ZJModels DHS710 is a 36V Cordless circular saw powered by two 1..
18V BRUSHLESS 125MM ANGLE GRINDER LXTDGA506ZTechnical specificationsTopBattery TypeLithium-ion ..
18v BRUSHLESS 125MM ANGLE GRINDER DGA508ZTechnical specificationsUser benefitsVibrationStandard..
18V ROUTER/TRIMMER BL LXTDRT50ZJX3Technical specificationsUser benefitsVibrationStandard equipmentIn..
18V COMBI DRILL LXTDHP458ZTechnical specificationsUser benefitsVibrationInformation & Technologi..
18VX2 ANGLE GRINDER 230MM BL LXTDGA900ZTechnical specificationsTopBattery TypeLithium-ion Body ..
Job Site RadioDMR107USER BENEFITS:Newly compatible with 10.8V CXT slide batteriesIP64 rated du..
JOB SITE RADIO DAB WHITEDMR104WTechnical specificationsUser benefitsStandard equipmentInformation &a..
18V COMBI DRILL LXTDHP453Technical specificationsUser benefitsVibrationStandard equipmentInformation..
18V ANGLE GRINDER 115MM BL LXTDGA467ZTechnical specificationsUser benefitsVibrationStandard equipmen..
18V ANGLE GRINDER 125MM BL LXTDGA517ZTechnical specificationsUser benefitsVibrationStandard equipmen..
18V ANGLE GRINDER 125MM BL LXTDGA513ZTechnical specificationsUser benefitsVibrationStandard equipmen..
18V RECIPROCATING SAW BL LXTDJR188ZTechnical specificationsUser benefitsVibrationStandard equipmentI..
TWIN 18V HEDGE TRIMMER LXTDUH551ZModel DUH551 is a cordless hedge trimmer powered by two 18V Li-ion ..
18V 52CM HEDGE TRIMMERDUH523ZUser-replaceable 520mm blade. Stain free shear blade surface of glitter..
TWIN 18V HEDGE TRIMMER LXTDUH651ZModel DUH651 is a cordless hedge trimmer powered by two 18V Li-ion ..
18VX2 BLOWER LXTDUB362ZModel DUB362 has been developed as the most powerful cordless blower, which o..
TWIN 18V CORDLESS LINE TRIMMERDUR364LZModel DUR364L is a high power cordless grass trimmer with high..